Audient have updated their popular eight-channel preamp design to provide more features at a lower price. Audient's ASP008 eight-channel mic preamp set a benchmark performance‑price ratio, and has remained popular with enthusiastic amateurs and working professionals alike — it has been in production for the best part of a decade. From a performance point of view, Audient's classic design hasn't been found wanting, but as electronics technology has moved on (especially in the areas of digital conversion, power‑supply design, and cost‑effective manufacturing techniques), Audient decided to rework the ASP008, to see what performance, ergonomic, and functional improvements could sensibly be achieved. The result is the ASP880, which retains all the ASP008's key functions and qualities, but improves on it in so many ways. The first thing I noticed is the fresh new look. The familiar styling and layout of the original are retained, but the ASP880 sports new control knobs, more easily distinguished and legible panel labelling, and a new colour scheme on the illuminated buttons. The cylindrical, machined‑aluminium control knobs are much easier to roll between finger and thumb than the old flat‑sided knobs, and the potentiometers behind them are mounted with front‑panel nuts, giving much better support and improving the mechanical feel. The channels are more clearly differentiated, thanks to dark grey backgrounds with silver control legends. The use of blue lights on the previous model's phantom‑power button always unsettled me, so I was delighted to find that the ASP880 uses more conventional colour illuminations. The phantom‑power button now lights up red, while the pad, filter and polarity switches all illuminate in yellow/orange. The Line input function has been replaced with an external A‑D input mode, and that lights blue. Internally, the construction has also been tweaked to reduce light‑bleed between adjacent buttons, and the relative intensity of the different LEDs has been closely matched as well. These stylistic changes are small on their own, but together, they bring about significant ergonomic and operational improvements. Each of the eight preamps has front‑panel gain and high‑pass filter controls, and can be routed to the line or digital outs. Internally, the preamp circuitry is exactly the same, highly optimised hybrid circuit that Audient have employed in almost all of their desks and preamps to date. Employing eight discrete transistors (including a matched pair) and an op amp, this is a reliable, high‑headroom preamp that delivers excellent performance. The only difference between the ASP880 and the previous generation's implementation is that surface‑mount components are used, allowing an improved circuit layout with shorter signal paths and better technical specifications. The published equivalent input noise (EIN) figure for the mic preamp is ‑127.5dB, which is the same as the original, but my own bench tests indicated slightly better EIN and common‑mode rejection performance figures. These, once again, are small but worthwhile improvements. Apparently this re‑engineering of Dave Dearden's classic preamp design had its first outing in Audient's iD22 interface, and optimising the new SMD construction involved considerable time and care. Component selection and layout proved critical; MELF resistors were chosen for high‑current circuit elements to optimise the noise performance, for example, and a better matched‑transistor pair was also found. In terms of the preamp channel functions, everything is much the same as before, but with a few minor tweaks. The second‑order (12dB/octave) high‑pass filter is identical to that in the ASP008, and the filter turnover can be adjusted between 25 and 250 Hz with the second of each channel's rotary knobs. The +48V phantom-power and polarity‑inversion buttons are as before, too, but the switchable pad now attenuates the signal by 10dB rather than 20dB, because the internal gain structure has been modified slightly. Apart from phantom power, all of these functions apply to both mic and line inputs (and, in the case of channels 1‑2, the DI inputs too). The line‑input selector has been omitted because that functionality is now provided by the physical input connections. As well as the usual complement of analogue I/O, the ASP880 features a pair of eight‑channel D‑subs, providing a balanced insert loop, post‑preamp and pre‑converter. The input impedance is controlled, as before, from a recessed toggle switch, but the markings now refer only to 'lo', 'hi' and 'med'. The values are quoted as 200Ω, 3.6kΩ and 1.4kΩ, respectively, which is another change: the previous model provided 200Ω, 5kΩ and 1.2kΩ. The input‑impedance switch affects both the mic and line inputs, and alters the input sensitivity to a degree which is dependent on the source impedance. Changing the input impedance alters the way the microphone capsule is loaded electrically, and can bring about substantial tonal differences in dynamic mics and capacitor mics with output transformers. With a line input, the impedance switch really only changes the level: with a nominal 100Ω line source, switching from high to medium impedance reduced the input level by 5dB; the low impedance option knocked it back by 20dB. The published specifications claim the line input impedance is over 10kΩ, but I measured values of between 6 and 8.5 kΩ. For the mic input, I measured values of 220Ω, 2.8kΩ and 1.3kΩ. 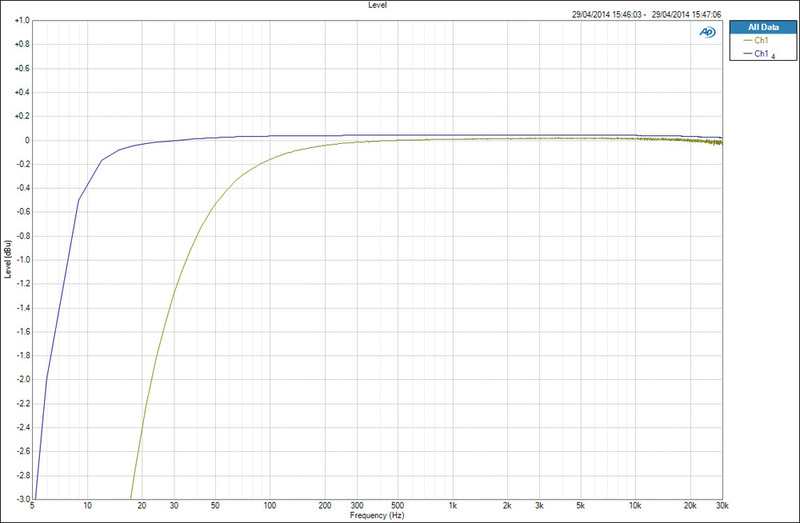 Engaging the pad didn't appear to change the impedance significantly. One of the most radical changes from the previous model is the employment of combi XLR sockets for each input, accepting mic signals on the XLR and balanced line inputs on the inner TRS socket. This decision makes the DB25 line‑input socket available for another function, which I'll come to shortly, and means a front‑panel line‑input button is no longer required. The down side is that it's no longer possible to have both mic and line sources connected to the preamp simultaneously, swappable at the press of a button. As in the ASP008, channels 1‑2 feature front‑panel unbalanced and high‑impedance (1MΩ) instrument inputs, which are activated automatically by inserting a plug in the front-panel socket. Mic and line inputs enjoy slightly different gain ranges, and the markings at each end of the control's rotation are 0dB and 60dB, which is what's available for the mic input (reducing to ‑10 to +50 dB with the pad engaged). 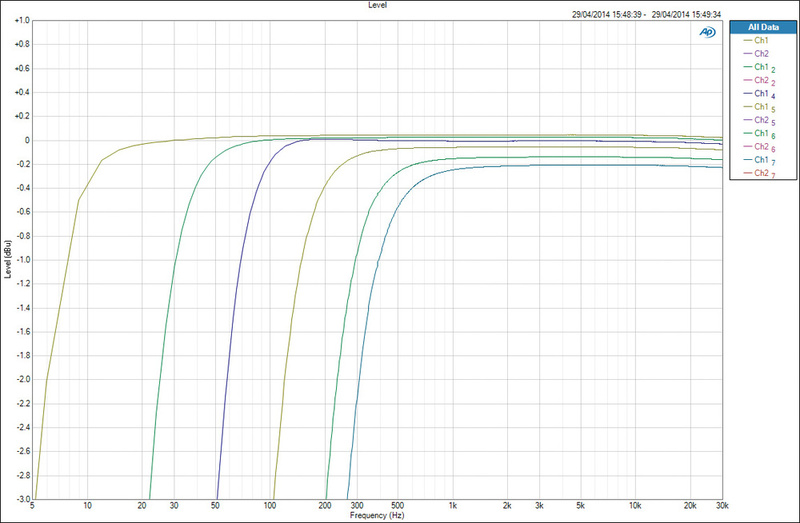 The line input is 10dB less sensitive, so the range is from ‑10dB to +50dB (or ‑20dB to +40dB with the pad). The DI input enjoys exactly the same gain range as the mic input, and can accommodate all manner of passive and active instruments without issue. The instrument input buffer is another new feature, by the way. The ASP008 employed a TL072 op amp to provide the high‑impedance buffer, but Dearden decided to use a discrete class‑A circuit in the ASP880, using an n‑channel J‑FET with a current source. This new design introduces a small but deliberate amount of second- and third-harmonic distortion to deliver a little subtle musical character. Two plots showing the level of mains harmonic components present at the digital outputs. 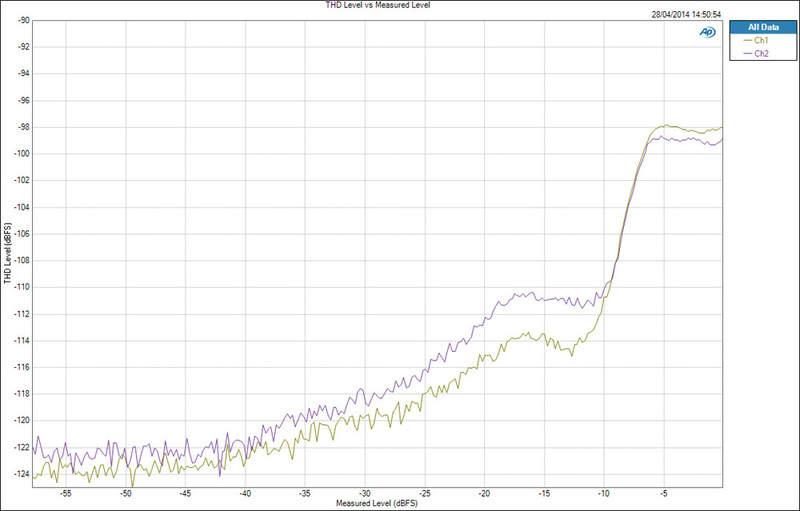 The upper green line is with 60dB of preamp gain, while the lower purple line is at 0dB gain. Absolute worst case is below ‑105dBFS which is an excellent result. As is typical of preamps with continuous gain controls, the gain tends to get bunched up towards the clockwise end of the control. However, in practice I had no problem setting high gains precisely, and the revised internal gain structure minimises the problem quite well. At the anti‑clockwise position (seven o'clock) the gain is 0dB, with 2dB at nine o'clock and 20dB at 12 o'clock. The three o'clock position provides 35dB gain and it's the full 60dB at the clockwise end‑stop at five o'clock. In other words, the top 25dB of gain is spread across the last 60 degrees of travel, which isn't bad at all. An expanded frequency response plot which illustrates how the low‑end extension changes with gain. 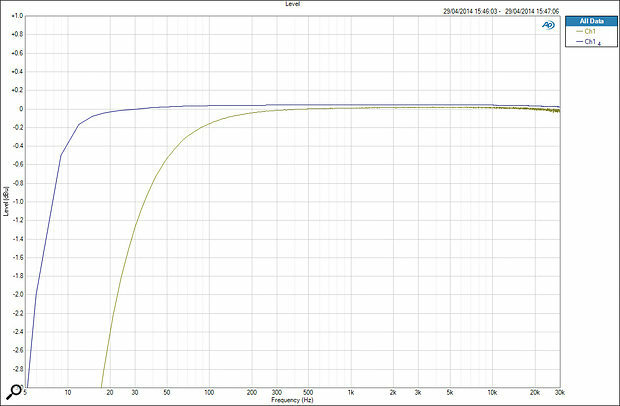 The blue curve is at 0dB gain, with a ‑3dB of 5Hz, while the green curve shows a ‑3dB point of about 18Hz at 60dB of gain. Both are perfectly acceptable, of course, but an interesting observation nonetheless. The high-end response is flat within 0.1dB to well beyond 80kHz at all gain settings for the analogue outputs. The digital output response is determined by the sampling rate, of course: the response is ‑6dB at half the sample rate. Putting some practical numbers on the gain ranges, a mic output of ‑52dBu will generate a sensible digital peak level of ‑10dBFS when the channel gain is at maximum. That could be produced by a dynamic microphone (2mV/Pa sensitivity) receiving 94dB SPL, or a capacitor mic (20mV/Pa) receiving 74dB SPL. If these numbers make your eyes glaze over, rest assured that there's plenty of gain on hand for all typical applications! Moving to the opposite extreme, the preamp's massive headroom is revealed when I tell you that the mic and instrument inputs can accept +28dBu with the pad engaged before overloading the converter, and the line input can accept 10dB more. Yet another new feature is a very welcome fully balanced insert facility. Analogue line outputs from each preamp are presented on a rear‑panel DB25 connector, wired to the AES59/Tascam standard. A cross‑coupled symmetrical balanced line driver, employed here, is capable of a massive +27dBu output level. As with the ASP008, a second DB25 socket accepts balanced analogue line-level signals, but instead of these being fed to the preamps, they're routed to the A‑D converters. The 'A‑D' button on each channel selects this external input to the converter in place of the corresponding preamp's signal. This flexible arrangement allows external processors to be inserted between the preamp and converter, or external devices to be routed directly to the A‑D section. For those who like to have both mic and line sources connected simultaneously, selectable at the press of a button, that functionality can be replicated in part, but only for the digital outputs. The line (return) inputs do not appear at the analogue outputs, and do not benefit from any of the preamp signal‑conditioning tools such as polarity switching, filtering and gain control. Naturally, the preamp line outputs are always active, so both analogue and digital outputs are available simultaneously. The A‑D external input level is fixed, with +18dBu delivering 0dBFS (the EBU standard alignment) and the input impedance is 22kΩ. It makes sense for a European manufacturer to embrace the EBU alignment, but a configurable option (via internal jumpers?) to accept +24dBu for full scale (the SMPTE alignment) would provide compatibility with high‑end equipment from elsewhere. Channel level metering on the ASP880 uses the same, simple two‑LED 'signal present' and 'peak' traffic‑light system found on the ASP008, although these register the signal level at the A‑D converter, rather than the preamp output. The green 'signal present' light starts to illuminate at around ‑45dBFS (‑28dBu) and gets progressively brighter with increasing input level, reaching full brightness at ‑28dBFS (‑10dBu). The 'peak' light comes on at ‑2dBFS (+16dBu), two decibels below converter clipping. The digital interface was an optional extra in the ASP008, but it's now a standard fitment, and it's another new design. The A‑D converters are Burr‑Brown PCM4220 multi‑bit delta‑sigma devices, replacing the Wolfson chips of the ASP008 (the same Burr‑Brown converter is used in the iD22). The PCM4220 is a high‑quality converter, with the usual 'half‑band' response, meaning the anti‑alias filter has only introduced 6dB of attenuation at half the sample rate. The sample-rate options are still sensibly restricted to base and double rates (ie. up to 96kHz) and the output is always 24‑bit. The previous model's 16‑ and 20‑bit modes have been omitted, since short-word‑length recorders such as DAT and CD‑R are no longer commonplace. A front‑panel button cycles around the four available sample rates, with a fifth position selecting the external word-clock option. The button flashes if there's no clock present, and illuminates steady green when locked. A rear‑panel push button terminates the word clock input with 75Ω. This graph shows the total harmonic distortion level produced by the A‑D converter relative to its digital output level. The THD figure rises gradually from ‑120dBFS with increasing output level, as would be expected, before jumping about 12dB as the signal level exceeds ‑10dBFS. This is a recognised characteristic of this family of converter chips and, although probably inaudible, highlights the benefits of maintaining headroom when recording! I measured the AES17 dynamic range performance for the A‑D converters using the insert return to AES3 out, and obtained a figure of 116.5dB (A‑weighted). This is a respectable figure, and places the ASP880 in the company of products like the Antelope Audio Orion, UA Apollo and Focusrite Rednet. The THD+noise figure was below 0.001 percent, comprising predominantly odd harmonics. As with the ASP008, digital outputs are provided simultaneously on ADAT optical ports and a configurable DB9 socket, the latter offering AES3 or S/PDIF and controlled by a rear‑panel button. The output formatting is all taken care of by an XMOS micro‑controller on the new digital board, which again affords better performance and flexibility than the previous incarnation. Two ADAT optical ports are provided, to accommodate eight channels at double sample rates using the S/MUX format. The upper lightpipe port provides eight channels at base sample rates, and channels 1‑4 at double sample rates. The lower port comes into play for double sample rates, when it carries channels 5‑8. Although the digital card is included as standard, the DB9 breakout cable required to access the AES3 and S/PDIF signals is not. However, the wiring details are provided in the manual, and the interface conforms with the ASP008's implementation (as well as that used by Focusrite on the original ISA428 Pre‑Pack digital interface and other early ISA digital option cards). Talking of the manual, that's not included either: Audient say they're doing their bit to save paper! The shipping box contains the ASP880 itself, a mains cable and a Quick Start Guide. The Quick Start Guide is useful, but the full manual, available as a PDF on Audient's web site, along with a recall sheet, contains much more interesting and helpful information. The final major upgrade is a new power supply. Instead of a relatively inefficient linear supply with a heavy transformer, the new model features a switched‑mode power supply, which was designed in‑house. This brings many advantages, the most obvious being that a cooling fan is no longer required: the ASP880 is acoustically total silent! It also operates on any AC mains supply voltages between 90V and 264V, with a maximum power consumption of 40W. There's no mains on‑off switch, front or rear, but a yellow power‑on LED is provided. A set of high‑pass filter responses. 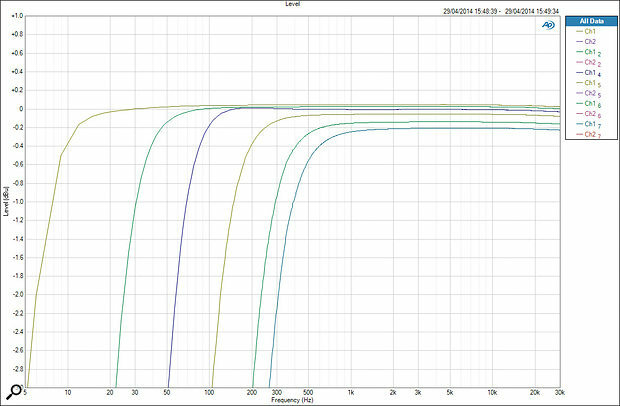 The left‑most green curve is with the HPF bypassed, while the others illustrate a variety of HPF settings from the 25 to 250 Hz settings. It can be seen that the marked lowest and highest turnover frequencies are accurate. The preamp gain clearly diminishes fractionally with HPF setting, but only by 0.2dB, which is inaudible, and is only exposed here because of the expanded amplitude scale. Another major benefit is that the level of mains‑related hum components at the audio outputs is much lower than is achievable with an internal linear supply. 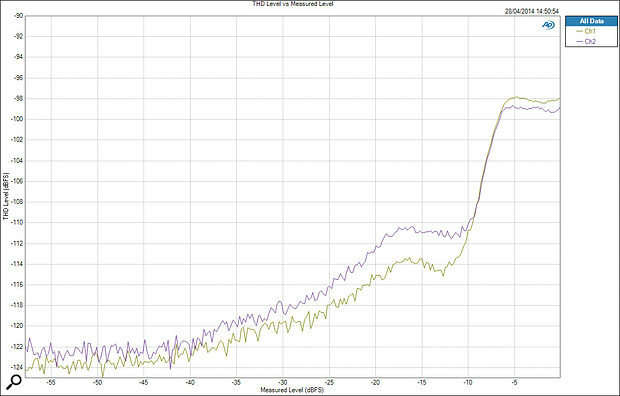 The highest-level mains component I measured was below ‑85dBu (‑105dBFS) with maximum preamp gain, and below ‑110dBu (‑130dBFS) with minimum gain. These are unusually impressive figures! The careful mechanical design required to achieve full EMC approval for the ASP880 has also resulted in more small but significant improvements in overall performance and practical resilience from unwanted interference. I'm extremely impressed with the ASP880. The previous model was very competent and versatile, and delivered a high standard of reliable performance. However, the cooling fan could become annoying in some situations, the panel markings were hard to read under some lighting conditions, and I often got my fingers tangled up with the flat‑sided knobs! The new ASP880 is an elegant evolution of that design, retaining almost all of its strengths while improving on every aspect, incrementally in some areas and radically in others. Sonically, this sounds like every other Audient preamp I've used: clean, quiet, accurate, transparent and with masses of headroom. It doesn't impose any significant character, although it can get a little crunchy in a nice way for drums if pushed. The technical performance is measurably better across the board, but especially in the A‑D conversion, and the major signal‑path reconfiguration to allow fully balanced inserts will appeal enormously to many potential users. Of course, some may lament the consequential loss of switchable line inputs to the preamp — and their availability at the analogue line outputs — but the benefits far outweigh the disadvantages. There are 'better performing' preamps and A‑D converters on the market, but they really aren't that much better, and they cost a lot more. Talking of price, I was astounded when I learned that the ASP880 costs almost 30 percent less now than the ASP008 did when we reviewed it back in 2006! And that seals the deal as far as I'm concerned: I can't think of a better‑performing or better‑equipped eight‑channel preamp at anywhere near the price, which makes the ASP880 a no‑brainer for anyone seeking a high‑quality professional multi‑channel mic preamp with digital outputs. Although there are cheaper options, such as the Behringer ADA8200, the only eight‑channel preamps I can think of that boast broadly comparable quality and integral A‑D conversion, and are similarly priced, are the Midas XL48 and RME Octamic II. Both are actually slightly more expensive and neither have the versatile balanced-insert functionality of the ASP880. Audient's typical clean and accurate sound character. Improved technical specs and construction. Eight mic/line channels, two with DI. Simultaneous ADAT and AES3/S/PDIF digital outputs at both base and double sample rates. Analogue insert and external A‑D input options. Universal internal power supply means no noisy fans are required. Improved panel markings, LED illumination and ergonomics. External A‑D converter inputs are restricted to +18dBu max. Full manual only available as a download. AES breakout cable not included. The ASP880 is a very impressive reworking of Audient's classic Dave Dearden-designed eight‑channel preamp box. Although it's basically the same, it's also better in every way — and costs around 30 percent less than the original!